U.S. Secretary of State Hillary Clinton reportedly fainted from being dehydrated and suffered an apparent concussion in the incident. NBC's Andrea Mitchell reports. Updated at 6:45 p.m. ET: Secretary of State Hillary Clinton fainted days ago and suffered a concussion after becoming dehydrated because of a stomach virus, the State Department said Saturday. "She has been recovering at home and will continue to be monitored regularly by her doctors. At their recommendation, she will continue to work from home next week, staying in regular contact with Department and other officials," the State Department said in a statement. State Department officials said Clinton, 65, fainted earlier this week, although they would not specify when the incident occurred. "Secretary Clinton developed a stomach virus, leading to extreme dehydration, and subsequently fainted. Over the course of this week we evaluated her and ultimately determined she had also sustained a concussion. We recommended that the Secretary continue to rest and avoid any strenuous activity, and strongly advised her to cancel all work events for the coming week. We will continue to monitor her progress as she makes a full recovery." NBC’s chief medical editor Dr. Nancy Snyderman said Clinton’s exhausting schedule could have made her susceptible to fainting. Clinton is known for her grueling travel schedule and has earned the distinction of being the secretary of state who has traveled the most. “If a patient has been logging millions of miles a year and is tired and not eating or drinking the right things in a couple of days, a shift in blood volume can cause fainting,” Snyderman said. This isn’t the first time Clinton passed out after having a stomach bug. As a U.S. senator representing New York, Clinton fainted in 2005 during a speech in Buffalo after complaining of a stomach virus. She said that given Clinton’s past fainting episode, her doctors would likely put her through a cardiac stress test. The concussion will have doctors “watching her like a hawk,” Snyderman said, particularly if Clinton hit the side of her head. If Clinton hit the back of her head, her brain would be better protected, she said. Clinton canceled a trip to Morocco earlier in the week because she wasn't feeling well. She was scheduled to be in Morocco to officially recognize the Syrian rebels who have been engaged for nearly two years in an armed battle against Syrian President Bashar al-Assad’s regime. U.S. Secretary of State Hillary Clinton came down with a stomach bug earlier this week and fainted, suffering a concussion. 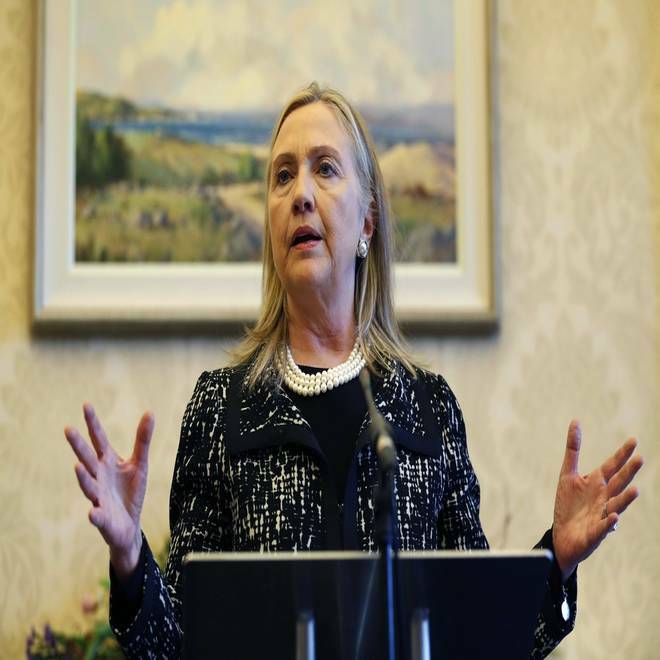 Here she is pictured speaking during a news conference at Stormont Castle in Belfast, in Northern Ireland, on Dec. 7. Due to her health, Clinton will no longer testify at a House Foreign Affairs Committee on Thursday on the attack on a U.S. mission in Libya. "I am sorry to learn of Secretary Clinton's ill health and I wish her a quick and full recovery. It is, however, unfortunate that Secretary Clinton is unable to testify next week before the House Committee on Foreign Affairs on the investigation into the terrorist attack that killed four Americans and left others injured," committee chairwoman Rep. Ileana Ros-Lehtinen, R-Fla., said in a statement. Deputy Secretary William Burns and Deputy Secretary Thomas Nides will provide testimony in Clinton's absence. "Although I respect Bill and Tom, we still don't have information from the Obama administration on what went so tragically wrong in Benghazi that resulted in the deaths of four patriotic Americans," Ros-Lehtinen said. "We have been combing through classified and unclassified documents and have tough questions about State Department threat assessments and decision-making on Benghazi. This requires a public appearance by the secretary of state herself. Other cabinet secretaries involved should also be held publicly accountable."